The end of Q2 was marked by the World Bank’s recent revision of its global growth forecast at 2.4%, as the 2016 global trade outlook remains conservative, with extra uncertainty added by the UK’s intention to leave the EU.iAgainst this background, growth in Asia Pacific promises to remain strong at 6%, economists say, with China predicted to retain its steady pace of 6.7%.ii Indeed, QIMA saw +7% growth in China for Inspection and Audit volumes year-to-date. Local consumption is expected to drive China’s growth as the government plans on making available more varieties of higher-end consumer goods, enhancing product designs, and encouraging major domestic producers to meet international quality standards.iii QIMA data shows that local production quality remains a struggle: inspections performed in China for local brands and buyers saw failure rates increase by +28% YTD 2016 vs. 2015. Elsewhere in Asia, trade activity also strengthened in India and Pakistan where QIMA data shows a two-fold increase in product inspection volumes over the last 12 months. As local apparel manufacturing powerhouses, both countries experienced double-digit YOY growth in export value for clothing and textile to the EU, according to recently published 2015 year-end figures.iv Quality trends remain a worry though, as failed inspections rate rose +26% in India and +42% in Pakistan year-to-date. Responsible practices and sustainable sourcing remain a challenge for apparel brands. Cotton sourcing practices in particular were in the spotlight in a recent report which slammed many major brands for doing “virtually nothing” to ensure their cotton is sustainable.v Forced and child labor are a particular risk to apparel supply chains, and top cotton exporters including Uzbekistan and Turkmenistan are highlighted for doing little to enforce the conventions they sign.vi The same research demonstrates the correlation between child labor risk and sufficient adult wages. 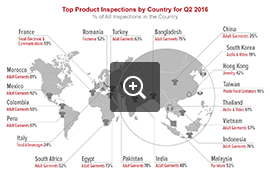 QIMA's data on structural audits for Q2 2016 concurs and indicates a worrying trend: 53.3% of all factories audited were ranked as “Immediate Action Required” or “Need Improvement”. While sourcing challenges remain, recent research shows the global apparel and footwear sector continues growing, and the most dynamic regions are the Middle East and Africa, where sales of apparel and footwear are poised to hit USD 134 bn. by 2020.ix Africa in particular deserves attention, as apparel and footwear manufacturers have already realized its potential for sourcing, and now its consumer base, largely a younger and tech-savvy demographic, is also showing great promise. 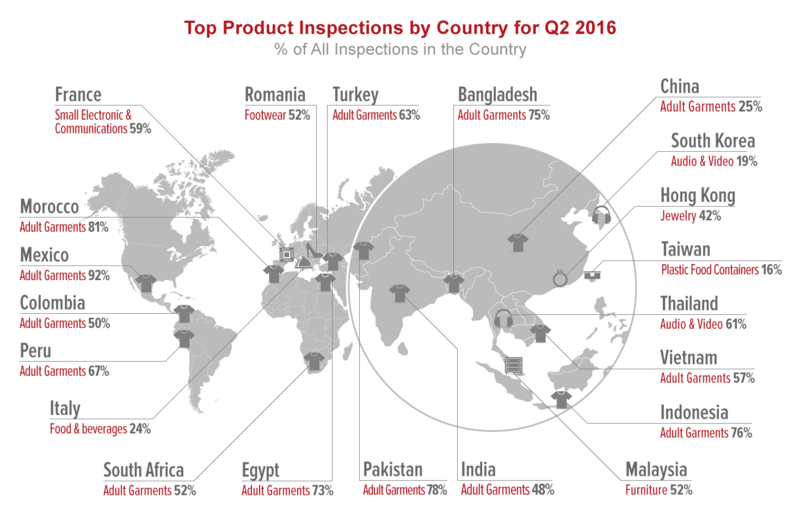 QIMA data indicates that while the manufacturing base in Africa is growing, it is still immature: inspection demand saw +61% growth year-on-year, but at the same time failed inspections rate surged by +15% in 2016 YTD versus last year. Other industries are not exempt from responsible sourcing issues. The jewelry industry, for instance, sees sustainability efforts gaining momentum with the audit program for jewelers launched by the Responsible Jewelry Council.x As the EU recently adopted the framework to curb trade in conflict minerals,xi this program’s membership is poised to increase further. Across industries, QIMA data shows that unethical labor practices remain among the most pressing issues discovered during ethical audits: in Q2 2016, 5.9% of audits failed in the “Child Labor” section, an uptick from the Q1 figure of 4.6%. Meanwhile, QIMA Lab Testing results evidence that in Q2 14% of all tested products failed to comply with safety standards when tested at the source, when brands and buyers can still address and correct issues before products get shipped. Given this scale of quality failures and the obvious ineffectiveness of recalls, the cost-saving and reputational value of preventive quality control is more apparent than ever.